Remember those old satellite broadcast trucks that you used to see outside live television broadcast events? 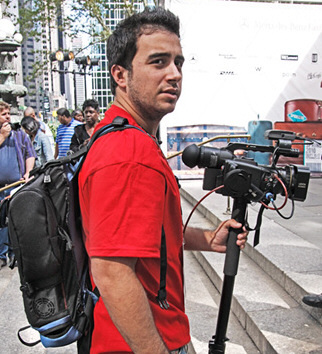 Well think of them as historical artifacts from now on, because this new Livestream Livepack wireless video streaming system replaces that whole dinosaur $250K rig with a backpack. Yep, that’s it. Just hook your Firewire DV camera up to the backpack, which contains 6 load balanced 3G/EVDO SIM card modems, press the record button and you’re live to the world from anywhere there’s a 3G cell phone signal. The box contains the encoder and battery, and you can attach an external battery to give up to 3 hours of continuous recording at a time. The video is HD, 1 Mbps, H.264, so your viewers will not be disappointed with the image quality either. They’re calling it a satellite truck in a backpack, and at $2500 a month rental ($1500 a month on the annual plan) it could just revolutionise the whole news and local event reporting business in a big way. The monthly fee covers 30 hours of streaming including data fees, so small operators suddenly have a way to compete with the big shot news reporting outfits at a price that’s a game changer. Amazing tech. US only at the moment alas. The technology aggregates the bandwidth from six built-in 3G modems in order to get the highest possible available bitrate. Maximum redundancy and reliability is achieved even if one or two of the networks are not available or have very poor connectivity (i.e. the technology can usually get a high quality stream out to the Livestream Platform). Without the satellite truck where is the director going to sit? Surely not on that poor man's back as well!